O'Brien is arrested by the Cardassians and put through the Cardassian legal system for allegedly stealing weapons for the Maquis. The propaganda screens seen on Cardassia Prime are pitch perfect, helpful in understanding the jingoistic Cardassian mind-set. When Kira raises the possibility that O'Brien is guilty (no doubt a bit of projection from the former freedom fighter) and Sisko doesn't dismiss it out of hand, that's something you would never see on board the Enterprise. Though this episode is obviously focused on the O'Briens, it actually develops Odo a little more. His sense of justice is his own, but here he is clearly showing his disdain for the Cardassian system he worked under for many years. 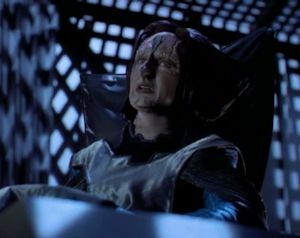 The episode elaborates on Cardassian politics and the Cardassian legal system, discussed just a few episodes ago by Dukat in "The Maquis, Part II." The idea of a court that isn't interested in justice as much as it is in demonstrating order and the infallibility of the State is so alien and horrific to us that we don't want it to make sense, and yet the writers are careful not to pass a full-throated judgment on the system. Sisko has the opportunity to publically embarrass and reject the Cardassian system on live Cardassian TV (as Kirk and Picard probably would have), but he doesn't, allowing the Archon to save face in the end. This is good sci-fi--even though it has very little science in it--because it uses an extreme society to comment on our own assumptions. This isn't the last time O'Brien is falsely accused of a crime and faces alien justice, as he undergoes an even more extreme punishment in "Hard Time."